A mother who broke her wrist in a car crash with the Duke of Edinburgh is considering a personal injury claim, it has emerged, as she calls for the 97-year-old to stop driving. Emma Fairweather, who was the passenger of a Kia Carens car which collided with the Duke's Land Rover, said she felt "ignored and rejected" by the Royal Family after the accident. Admitting she had hoped for an apology from the Duke and "a card and a bunch of flowers" from the Queen, she claimed the injury had affected her independence and may require surgery. Ms Fairweather was one of two women in the Kia, which was left on a verge after colliding with the Duke of Edinburgh's car. Her 28-year-old friend, who was driving, suffered cuts to her knee, and a nine-month-old baby escaped unharmed. The Duke, who has subsequently been photographed driving a replacement Land Rover into the Sandringham Estate without a seatbelt or the presence of his protection officers, suffered "no injuries of concern", Buckingham Palace said. In an interview with the Sunday Mirror newspaper, Ms Fairweather, a 45-year-old mother-of-two, said: "I haven't had any contact from the Royal household. Maybe he [the Duke] should prioritise that over test driving his new car." 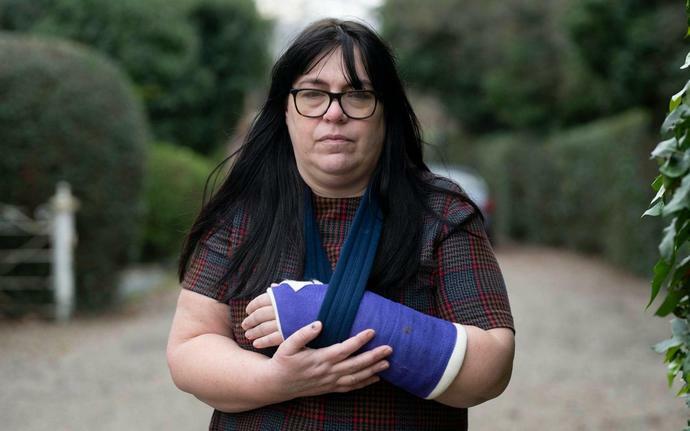 Having recently started a new job as a support worker, the newspaper, said, she is "now considering a personal injury claim after being told she could face two months off work". Ms Fairweather said she was "really shocked" that the Duke had already been out driving, adding: "I very much hope he'll consider stopping. "I think he should be treated the same as anyone else. How could you say no to prosecuting him if he's broken the law?" Ms Fairweather also claims she has not been contacted by anyone at Buckingham Palace, instead received a message via a police liaison officer, saying: "The Queen and the Duke of Edinburgh would like to be remembered to you." "That's not an apology or even a well-wish," she told the newspaper. "I love the royals but I've been ignored and rejected and I'm in a lot of pain. "The police haven't given me any emotional support either." A palace source yesterday insisted that a number of attempts had been made by at least two senior aides to contact both the driver and passenger to "see how they are and offer messages of goodwill and good wishes" from both the Queen and Duke. The source denied that the two women were being ignored by the palace, with a "full message of support" sent via a police officer on Friday while the permission of the women was sought for their contact detail to be passed on to staff. It is understood that further attempts to contact the women at their respective homes to deliver a more personal message had been difficult, with both thought to be staying elsewhere temporarily. A senior aide from the palace is now in touch with the driver. The Royal Family's engagements will continue this week as planned. The Duke of York, Prince Philip's son, was yesterday visiting Sandringham, attending church with the Queen for the Sunday morning service. The Queen, wearing a camel-coloured coat, hat and black gloves, looked well as she arrived in a black Bentley and walked the short distance from the car to the entrance of St Peter church in Wolferton, Norfolk. The church is just over a two-mile drive from Sandringham House, and dozens of well-wishers gathered behind a rope fence to see her arrive. While the Duke's defiant response to the crash, which saw him go out driving without a seatbelt just two days later, drew criticism from the public, those who turned out to see the Queen walk into church were more sympathetic. John and Joy Dawson, from Sandringham, said of the Duke: "We are just very thankful that no serious harm came to him." LONDON (AP) - U.S. President Donald Trump will pay a three-day state visit to Britain as a guest of Queen Elizabeth II in June, Buckingham Palace announced Tuesday - more than two years after Britain extended him an invitation for a pomp-filled ceremonial stay.